La La Land leads film nominees with 14 nominations, tying the record set by Titanic and All About Eve. Moonlight and Arrival each received 8 nominations followed by Lion, Hacksaw Ridge and Manchester by the Sea each receiving 6. See a full list of nominees here. Tune in to the ceremony, hosted by Jimmy Kimmel, Sunday, February 26, 2017 at 8 p.m. EST on ABC. Watch the nominee announcement here or read the list of nominees here. This past year was a difficult year to be an excellent movie because there were so many amazing films that many were lost in the shuffle and did not receive the recognition that they deserved, but it is important to remember that accolades do not singularly determine a film’s worth, and many great films have gone, and will go, unrecognized. Many wonderful and amazing films were made and many of them were well represented and garnered already this awards season. Everyone’s first question when nominees for anything are announced is “who is missing?” This year, as is the case every year, some films are snubbed because there just aren’t enough spots for every great film. Tom Hanks, or Tam Honks if you prefer, did not receive nominations for either of his major roles this year as Captain Phillips in Captain Phillips and his role as Walt Disney in Saving Mr. Banks. Emma Thompson was also left off the list for her role in the latter. Lee Daniels’ The Butler was also left out of all major categories, most notably lacking nominations for Oprah Winfrey in the Best Supporting Actress category and Lee Daniels for Best Director. All is Lost was all but shut out of the race, receiving only one nomination for sound editing. Ron Howard’s film Rush was completely shut out of the nominations,however, due to it’s poor overall box office performance it is not an incredible shock. Her received five (well deserved) nominations, but did not earn a nomination for the film’s star Joaquin Phoenix. Blue is the Warmest Color was shut out of the race entirely (although it was not eligible for Best Foreign Film, it was eligible for other categories). Enough Said was shut out, which registers on a different level of hurt given that it was James Gandolfini’s final performance and Julia Louis-Dreyfus’ first major role in years. Inside Llewyn Davis was completely shut out as well which is particularly surprising given that it was thought to be one of the best films of the year by many. This is by no means all of the snubs (and a more complete list can be found here) but the aforementioned problem of the sheer volume of amazing films made this year has made it an equally big year for snubs. Leonardo DiCaprio, however, DID receive a nomination and if he wins for Wolf of Wall Street it will be his first Academy Award, because of this and many other deserving nominations, one should keep in mind that snubs do not take away from deserving nominations. Another interesting aspect of the Oscars will be the award show itself. This year they, the executive producers, have decided on a superhero/movie hero theme for the show. It will be interesting to see exactly what this entails and whether it adds to or takes away from the show itself. Another interesting aspect will be Ellen DeGeneres as host of the show. 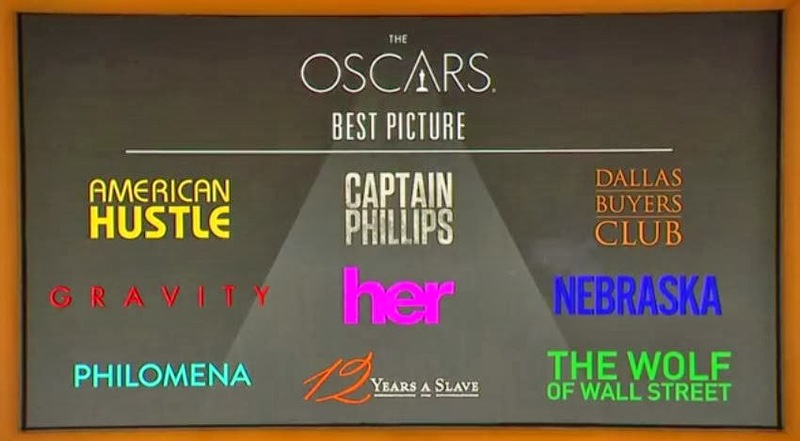 Watch the Oscar race conclude on Sunday, March 2nd. The Critics’ Choice Movie Awards have more specific categories than many of the other award shows, such as the Academy Awards or the Golden Globes. The awards therefore lend themselves to honoring stars who may otherwise miss out in more general categories. One example of this is Mark Walberg’s win for Best Actor in an Action Movie for Lone Survivor. At one of the larger awards shows he would likely have been lost in the shuffle of bigger films that have had larger numbers at the box office, bigger stars, or more well-known stories, but the Critics’ Choice Awards gives him a chance to be recognized. They also recognize younger talent with the Young Actor or Actress Category which this year saw a win for Adèle Exarchopoulos for her role in Blue is the Warmest Color. The cast of American Hustle won Best Ensemble of the night, an award many hoped would go to the cast of The Butler given that it was shut out of the Oscar nominations. Best Supporting Actress went to Lupita Nyong’o, a very deserving and talented actress who played such a great part in 12 Years a Slave. Best Director was given to Alfonso Cuarón for Gravity. Many other wonderful talents were also awarded with well deserved awards at the show (a full list can be found above). One of the wonderful things about this award show is giving filmmakers, actors and other people responsible for aspects of filmmaking to be honored. It takes so much work to make a movie and so many people give up their time and temporary sanity to make films something worth watching. Even with all of the talent and effort in the world, it is difficult to make a film that will do well at the box office, resonate with viewers, AND be met with critical acclaim. When a team is able to make a film that meets all of these criterion it deserves, more than anything else, to be recognized for its achievement. Connecting readers with all things entertainment related! Look for musical, play, and movie reviews, awards season coverage and much more! Based out of Raleigh, NC.